My Creative Time: Guest Designer: Ruthie! I was thinking a couple days ago, it seems like there has been a baby explosion these last couple of months, at least in my life anyway. I have quite a few friends who have either just given birth or are getting ready to pop. I've been bust making lots of baby gifts and new baby cards. I thought I would share one of the cards that I made, with you today. My "All Star Baby" stamp set has gotten a work out these last couple of weeks. It's a great set! Do you have it? There are a ton of great sentiments that can be used on baby cards, scrapbook pages, and even baby shower invites. 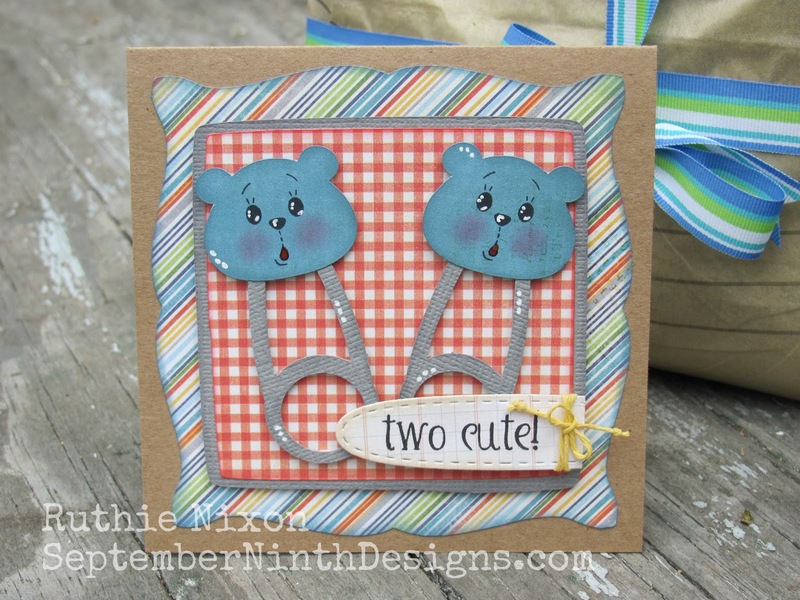 I made this card for a friend who just had twin boys. I just love those sweet bear diaper pins, don't you?! Sentiment stamp: My Creative Time's, All Star Baby stamp set. Die: My Creative Time's, Stitched Oval die. Frame SVG: Lettering Delights, Provecial Princess Collection. Bear Diaper Pin SVG: Treasure Box Designs, Baby Shower Boy Collection. 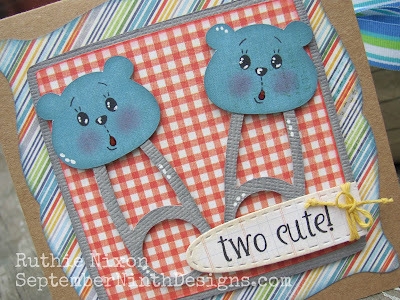 Bear Faces: Peachy Keen Stamps, Teddy Bear and Reindeer Face Parts. Yellow Twine: Liz's Paper Loft Boutique. Thanks for stopping by today, I hope you have a wonderful day! I LOVE this!! What an adorable card!! Ruthie ~ this is just ADORABLE! I LOVE what you did with the stitched oval die! How CUTE are those baby diaper pins!! Of course I LOVE the shape and the paper! Awesome job and your friend will LOVE getting this card! This is really adorable, Ruthie! I am loving the diaper pins, especially the cute faces you put on them! Perfect frame too! So ADORABLE! What perfect little faces!! Very cute Ruthie and Happy Monday to you too. Love the paper. This is just too cute and yes I love the bear pins. omgoodness! So adorable! I agree baby boom this time of year in my area too! 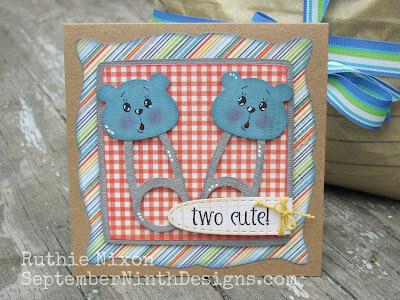 The bear pins are so adorable, and i'm sure the twin boys are too! Thanks for sharing your card. Great job on your card...Perfect SVG's for the project and who could resist the Peachy faces. ruthie, I looovie your card! This is definitely a card to save and put in the baby book. How wonderfully precious is this card? So stinkin' cute. I need to think about getting this set of stamps! Thanks so much for sharing. This couldn't be sweeter! Thanks for stepping in for Emma. I hope the family is doing well! I just found Emma's blog and I am loving the guest designer thing! I loved this card you made Ruthie! It is so adorable!